Summer bodies are made in the winter. This is even truer in dermatology than it is in the gym. 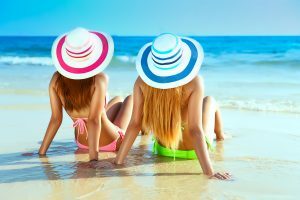 Spider veins, sweaty armpits, unwanted hair, and stubborn fat pockets can be gone by beach season… But you have to plan ahead! Spider veins are superficial, dilated or stretched blood vessels that have a branching pattern and are commonly found on the legs. They tend to increase in number and become more prominent with age. Risk factors include genetics, female gender, obesity, and prolonged sitting or standing. Spider veins can be treated with long pulsed lasers that target the hemoglobin inside the red blood cells and specifically break down the vessels. Skin should not be tanned prior to the procedure. Bruising afterwards is common and can take several weeks to resolve. Depending on the extent of the spider veins, compression garments may be recommended. Since we hide our legs under layers and boots to protect from the cold anyway, winter is the perfect time to tackle leg veins. If excess sweating and armpit stains ruin your summers, the time to learn your options is now. Excess underarm sweat is a common condition called axillary hyperhidrosis and it can be eliminated once and for all with a device called Miradry. After numbing medicine is injected, Miradry uses electromagnetic energy (“MiraWaves”) to destroy the armpit trifecta: sweat glands, odor glands, and hair follicles. There is a fair amount of swelling after the procedure that can take a couple of weeks to resolve, so baggy sweater whether is ideal. Overall, it is a small price to pay for dry, hairless, fresh smelling armpits this summer. Many of us have not even thought about shaving our hairy legs for several months now. But if you want to have smooth, stubble and ingrown hair-free skin by Memorial Day, the time to start the process is now. Laser hair removal is safe for all skin types and can be done anywhere on the body. While each session helps, most body areas require at least 6 monthly sessions to permanently reduce hair growth by 80%. Skin cannot be actively tanned prior to the treatment. Start now and you can make some serious hair headway. It is easy to forget about our pesky fat bulges (love handles, belly tires, saddle bags, back fat, bra fat, chin fat) under all the layers of clothing. But bikini weather will be back before we know it. TruSculpt is a revolutionary, non-invasive treatment for stubborn fat pockets. It works by using radiofrequency to heat and destroy fat cells. There is minimal downtime after the procedure but it takes 12 weeks to reach optimal results. Do the math and make a plan!